You are here: Home / Beginning Sound Letter Worksheeets / Fun, Free, Phonics Worksheets for Friday! 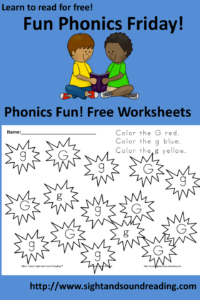 Fun, Free, Phonics Worksheets for Friday! It’s Friday again! That means it is time to have fun with some free phonics worksheets! Today’s worksheet highlights the letter ‘g’ -both the upper and lower case letters, as well as the two different fonts of the lower case g that frequently confuse early readers. As many of you know, Mrs. Karle likes to explicitly teach the confusing g to beginning readers. She first teachers her students the confusing letter g in Day 2 of her ‘learn to read for free’ program. She also teaches the confusing g through her unique alphabet. Additionally, I wanted to use this worksheet today because Mrs. Karle teaches the students to read the color words very early on in her program. By Day 10, the students can already read the words red, blue, and yellow -so, students who have just started her program should be able to read words and letters on this page! Anyway, please fill out the form below to receive an occasional email and to get your free worksheet for the letter Gg. Thank you so much. I love all the free worksheets you offer!